For Red Sox fans in 2017, watching the team win in a walk-off was beginning to seem almost routine. The Boston team had struggled a little out of the gate but pushed their way from third place in the AL East to second, then took first place the last week in June and held first before dipping to second on July 28. On August 1 they’d lost seven of their last 11 games and hadn’t won two in a row since July 18-19. Fans filing into Fenway the evening of August 1 knew that the team was just a half-game behind the New York Yankees in the standings. They hoped for a win, with Chris Sale taking the mound. He was 13-4 (with a 2.37 earned-run average), and in five July starts had surrendered a total of only five runs and hadn’t given up even one run in 21⅔ innings. The temperature was 83 at game time. Fenway Park was sold out for the 31st time of the season, with attendance later announced as 37,126. No one expected Sale to get hammered the way he did. The first three Cleveland batters all singled. Sale threw out one runner before he scored, and struck out two more but gave up three runs on four hits in the first. In the second inning, a two-run homer by Brandon Guyer made it 5-0, Indians. It definitely didn’t look to be Sale’s night. Boston rallied right away, though, in the bottom of the second with five hits and five runs off Cleveland starter Carlos Carrasco (10-4), driving him from the game.2 Mitch Moreland’s three-run homer into the right-field seats was the biggest of the blows. It was Moreland’s first homer in more than a month. The five-run deficit was the largest one the Red Sox had overcome in 2017, but in six times that the team had given up three runs in the first inning they had come back to even or better the score. Sale stayed in the game and got through the third and fourth, but in the top of the fifth, Edwin Encarnacion hit a two-run homer to give Cleveland a 7-5 lead. Blaine Boyer pitched for the Red Sox in the sixth. In the bottom of the sixth, the Red Sox leapfrogged the Indians to take a 9-7 lead after scoring four runs. Mookie Betts hit an RBI single and Nunez hit a three-run double off the left-field wall. In the top of the eighth, Carlos Santana led off with a home run off Addison Reed, Boston’s fourth pitcher of the night. He’d been traded to the Red Sox just the day before, and Santana was the first opponent he had faced while in a Red Sox uniform. But it wasn’t Kimbrel’s night, either. The first batter he faced was Indians shortstop Francisco Lindor, who homered to deep left-center on an 0-and-2 pitch. After Kimbrel secured two outs, there followed a single, a single, and a base on balls, loading the bases. A wild pitch allowed all the runners to advance a base, Jose Ramirez scoring from third base to make it 10-9, Indians. When Boston came to bat in the bottom of the ninth, Tribe manager Terry Francona called on his seventh pitcher of the night, Cody Allen, to secure the win. Allen was a hard-luck 0-5 at the time despite a decent 2.74 ERA. Allen struck out Jackie Bradley Jr. for the first out. Twenty-year-old rookie Rafael Devers reached first base on a weakly-hit ball to third base.6 Xander Bogaerts flied out to deep center. And then Allen struck out Mitch Moreland for the third out of the inning — but even though Moreland had swung enough to commit — and missed, the pitch hit the dirt, went wild, and took a big carom. Even with the relatively little foul territory behind home plate at Fenway Park, Moreland reached first base safely. Devers took second. Catcher Christian Vazquez came to bat. He’d been Boston’s principal catcher in 2017, but was batting ninth in part because he had 20 RBIs so far. He’d missed all of 2015 and most of 2016 due to injury. Normally, he wouldn’t have been in the game at all. Chris Sale had worked with catcher Sandy Leon all season long, but Leon was nursing a sore right knee. On a 2-and-1 count, with Red Sox fill-in broadcaster Jonny Gomes noting that Allen and catcher Yan Gomes (no relation) couldn’t seem to get on the same page, another wild pitch allowed both baserunners to advance. “Hold the phone,” O’Brien said. Now a well-placed single could potentially tie the game, though Moreland was not fast on the basepaths. On a 3-and-1 pitch, Vasquez homered to dead center field, hitting the ball into the triangle of seats in the bleachers, winning the game rather than merely tying it. It was the seventh walk-off win for the Red Sox in 2017 and catapulted them back into first place by a half-game, the Yankees losing to the Tigers, 4-3. “Is there a better way to get back into first place in August?” Jonny Gomes asked rhetorically. “How do you even begin to explain that game?” O’Brien asked. For Vasquez, it was only the fourth home run of his career, but all four had been go-ahead homers at Fenway Park, and in all four cases there had been runners in scoring position and two outs. Allen’s record became 0-6, and Kimbrel’s became 3-0. The Red Sox never left first place again, won the division, but lost to the ultimate World Series Champion Houston Astros in the American League Division Series, three games to one. This night, though, they had seemed nearly invincible, with poor performances by their ace starter and ace closer, both bailed out by an offense already seemingly accustomed to on-field celebrations after a walk-off. The author relied on Baseball-Reference.com, postgame notes supplied by the Red Sox Media Relations Department that evening, coverage in the August 2, 2017, Boston Globe, and the New England Sports Network (NESN) telecast of the game preserved on YouTube. 1 Leon had doubled to lead off the bottom of the 10th. With one out, Mookie Betts was walked intentionally to set up a double play, but a wild pitch by Mike Minor allowed both baserunners to advance, to second and third. Leon scored when Nunes grounded out, short to first. 2 Brock Holt was thrown out at the plate trying to score on Nunez’s double. The inning could have been even worse for Carrasco. 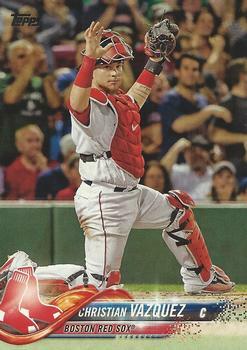 3 Peter Abraham, “Vasquez, Red Sox Save Best for Last,” Boston Globe, August 2, 2017: C3. 4 Julian Benbow, “A Day Later, Austin Jackson’s Catch Still Resonates,” Boston Globe, August 2, 2017: C1. 5 Kimbrel finished the season 5-0, with 126 strikeouts in 69 innings. He placed sixth in Cy Young Award voting. 6 Devers had only been called to the majors on July 25. This was his seventh game. His 2-for-4 night made him 12-for-28. He also walked once. 7 NESN telecast of the August 1 game, accessed at https://youtube.com/watch?v=LktXsmwxg18. 8 It turns out that 10 walkoff wins in a single season is not that rare. Dave Smith of Retrosheet ran a program that looked at all regular-season games from 1908 through 2017 (186,613 total games). In an email to the author on January 3, 2018, Dave reported, “Of the 2,370 team-seasons examined, 494 of them had 10 or more walkoff wins. The most walkoff wins for the 110 seasons was 18 by the 1959 Pirates, an incredible total for a team that finished fourth with a record of 78-76. Interestingly, the two teams with the most walkoff wins as a percentage of their wins at home are the 1962 Mets and 1952 Pirates, two really bad teams. They both had 22 wins at home, 9 on walkoffs. Only two times did a team have no walkoff wins: 1995 Expos and 1978 Cardinals. In fact, in the 2017 season alone, the Baltimore Orioles had two more walkoffs than the Red Sox — 12, with nine of those in extra innings, and the Athletics had 11.